Judge Friia is a graduate of Pace University School of Law, Class of 1979. She was the first recipient of the distinguished Adolf Homburger Humanitarian Award, and a founding member and early director of the Pace School of Law Alumni Association. Upon passing the Bar, she worked as an associate attorney for the White Plains law firm of Bender & Bodnar, Esqs. In 1984, Judge Friia began her own law practice concentrating in the areas of matrimonial and family law, real estate and commercial litigation. In 1993, Judge Friia was appointed Associate City Judge by the White Plains Common Council. She was the first woman appointed to the White Plains City Court bench. In 1997, she was appointed (full-time) City Court Judge and retired her private practice. Judge Friia became the Senior Judge the end of that year. In October, 2002, Judge Friia began the first Drug Treatment Court in the City of White Plains, an important and influential “problem-solving” Court program that has gained statewide recognition over the years. In January, 2007, Judge Friia was appointed to a second term as full-time City Court Judge. Throughout her judicial career, Judge Friia has served as a mentor to students of all levels. She has supervised law student interns, entertained college level student visitors, and regularly authorizes and conducts “Courthouse” tours. In 2012, she was honored to serve on the development team of the White Plains Youth Bureau sponsored Community Youth Court. Judge Friia is and has been an active member of area bar associations and is past President of the Westchester Women’s Bar Association. 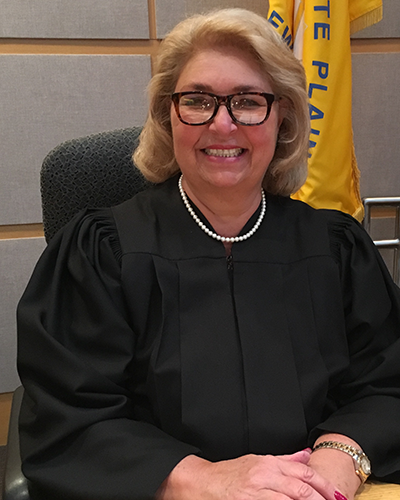 She is also on the Board of Directors of the Westchester Chapter of the National Council on Alcoholism and Drug Dependence, Inc. From 1985 to present, Judge Friia has taught law courses in the paralegal studies program(s) at Mercy College in White Plains and Manhattanville College in Purchase. Judge Friia is currently the President of the New York State Association of City Court Judges where she represents all City Judges throughout the State on issues of legislation, court operations and judicial initiatives. Judge Friia also serves as a liaison to other judicial organizations, including the Judicial Section of the New York State Bar Association. On a personal note, Judge Friia is a participating member of various Italian American organizations, in particular, the Antonio Meucci Lodge, No. 213 in White Plains. In 1996, she was honored to receive the Justice and Community Service Award from the American Committee on Italian Migration (Westchester County Chapter). Judge Friia is a White Plains resident since 1976, and is married to Anthony Fredella.